It was sort of love at first sight for me and this movie because laughing is my third favorite thing in life and because finally, finally, there’s a quasi-romantic comedy that doesn’t feature Katherine Heigl or Kate Hudson playing overly cutesy women who are as complex as a Post-It note. 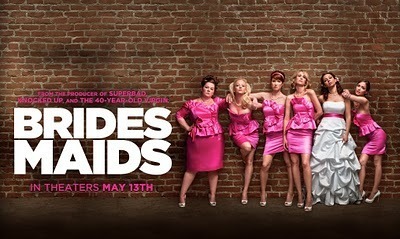 I walked into a screening of Bridesmaids last Friday night with a bag of popcorn and high expectations, expectations that the movie shattered. Sure, the bridal entourage consists of female stock characters – the cougar, the butch, the ingenue, the rich and impossibly pretty girl who, way-deep-down, feels lonely and inadquate. But Annie (Kristen Wiig) and her BFF Lillian (Maya Rudolph) feel like real women: they experience failures and successes, insecurities and triumphs, moments of shame and self-acceptance. Their longtime friendship takes some hits, but the their bond survives the taffeta-inspired drama of standing in a friend’s wedding. And the lead women look real, too, thanks to crows feet or a funny-shaped nose. There’s nothing cooler than women who can make a comedy about the ins and outs female friendship by being themselves and not conforming to the typical Hollywood aesthetic. It doesn’t hurt that the boys find it hilarious, too.